One button to set wheel speed sensor calibration. Simply put, the Traction Control commands the ECU to reduce power when the driven wheels are going faster than the un-driven wheels. On-the-fly adjustment of the target slip rate can be performed using a dash mounted switch. Will this work on my vehicle? If you have ABS, then the ABS sensors can be utilized. If your vehicle does not have ABS but is a model which supports ABS, then only the wheel speed sensors need to be installed. If you don't have ABS and no factory vehicle wheel speed sensors, then you will need to add your own ABS wheel speed sensors. Is this only for race cars? No, it works very well on street cars. Is this better than using a vehicle speed sensor for driveshaft rotation speed? Yes. The ABS ring typically gives 50 pulses per wheel revolution. The vehicle speed sensor on an 02 Acura RSX for example gives around 4 pulses per wheel revolution, which reduces the accuracy of your speed determination. In addition, the VSS cannot be used to determine if the car is cornering. Can you change tire sizes? Yes, setting up for different sized tires is very easy. Will this work on both front and rear wheel drive vehicles? Yes, the principle behind the wheel slip calculation is exactly the same for front and rear wheel drive. 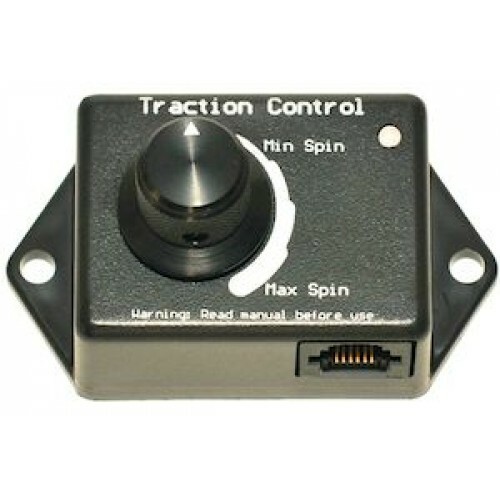 Does the Traction Control affect the ABS operation? 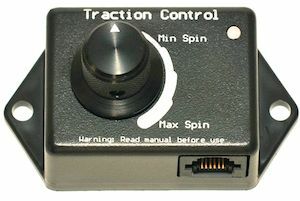 The Traction Control module has high impedance capacitively coupled wheel speed inputs which do not alter the signal to the ABS computer. However, if the ABS error light illuminates, or the ABS operation changes in any way, the vehicle should not be driven until the issue is identified and fixed. Do I need an ABS computer, or just the wheel speed sensors? Only the wheel speed sensors. Do I need four wheel speed sensors? Traction control will work with just one front and one rear speed sensor, but cornering slip compensation cannot be calculated unless you have two sensors on the un-driven wheels. Will hall effect sensors work? Yes, tie the negative side of the wheel speed sensor input to ground. My car lifts one rear (FWD) / front (RWD) wheel off the ground when cornering. Will the traction control cope with this? Yes, just set the speed determination method of that axle to 'fastest wheel'. 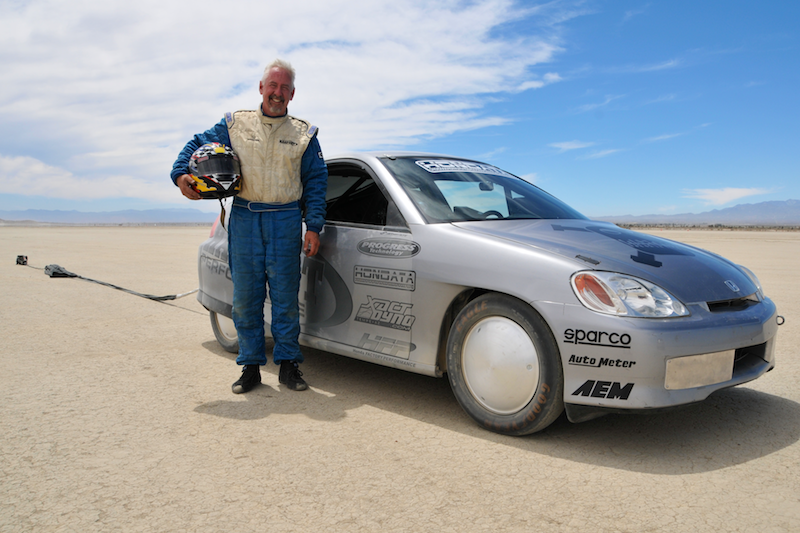 Brian Gillespie HASport: On the El Mirage dry lake bed, Hondata Traction control allowed me to control 500 HP through 4" tires improving my 1/4 mile by 1.3 seconds and speed at distance by 3-6 mph." CPL Racing: "After installation of Hondata's new traction control in my 2007 Civic Type R FN2 my 0-60 times improved by 1.5 secs." Diogo Oliveira, 2007 Civic Si, Sao Paulo Brazil: "My dry lap times improved by two seconds and my wet lap times by 4 seconds". Youtube video from BlackSi - Turbo 07 Si. Vitviper (8th Civic): "When I say that the Hondata Traction Control system is awesome, I do not say it lightly. I have a high HP turbocharged 2008 Honda Civic Si running FlashPro with a built motor and PPG geared transmission with a 64mm Comp Turbo turbocharger. When we initially broke it in on 91 octane it made 560whp at 13psi of boost pressure, and has since been retuned on E85 running as much a 26psi making somewhere in the realm of 700-750whp. Now this is mainly a street car with occasional quarter mile track visits – a full interior OEM looking vehicle with nothing that makes it stand out as anything but a typical Honda Civic other than the open wastegate dump and exploding tire smoke when I go full throttle. To say getting the car “manageable” for street driving was an understatement. In attempts to get it manageable I put a 3psi WG spring in and dialed the car in using the Hondata Boost Control system that comes with the FlashPro engine management software to limit boost in early gears for traction. This got me very close to a manageable high HP front wheel drive street car – but it was still wanting. Boost settings that work great when it’s 80 degrees out and the sticky summer tires are warm don’t necessarily work in cooler temperatures, or worse – rough road. Still not quite what I wanted – which was a fast and fun street car. Sure I got close with boost by gear – but it was still a handful to control the car. 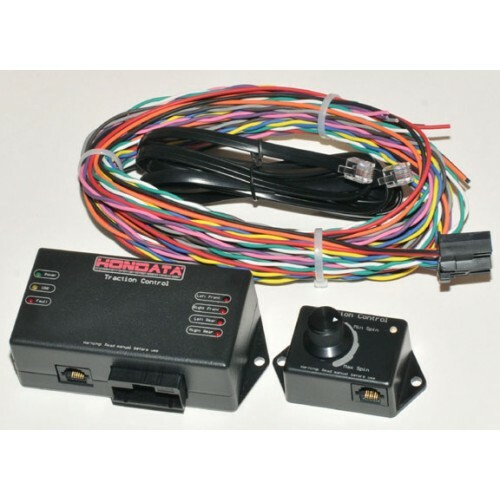 Enter the Hondata Traction Control system – this is exactly what was missing. A robust system with an intuitive interface to manage wheel spin using the OEM wheel speed sensors that come on the vehicle. Installation was simple and clean. One weekend dialing in the settings for the new system and it filled in all the gaps that boost by gear could never fill in on its own. The car was now an absolute blast to drive – no more “hang on and hope it doesn’t kill you”, but more so “hang on and enjoy the ride”. I could turn out and floor it in 1st gear and the car just GOES. As boost increases and power increases to the traction limit managed by the Hondata Traction Control unit the car just goes faster and faster with every gear shift. It’s simply amazing. I’ve had multiple passengers that have ridden along with me, and their statements always bring a grin to my face: “OMG OMG!” “WOW!” “What?? I just expected wheel spin with this much power!” I liked the product so much I installed a second unit in my turbo 400hp Acura Integra." s300/s300j Overview The s300 version 3 is a plug in module to the OBD1 factory Honda Engine C.. The K-Series Programmable ECU (K-Pro) consists of a hardware modification to any K-Series ECU, plus .. This is a Hondata modified 2002-2004 RSX ECU and an adapter harness for the 05-06 RSX Hondata mak..